So just how do we get electricity from water? Actually, hydroelectric and coal-fired power plants produce electricity in a similar way. In both cases a power source is used to turn a propeller-like piece called a turbine, which then turns a metal shaft in an electric generator, which is the motor that produces electricity. A coal-fired power plant uses steam to turn the turbine blades; whereas a hydroelectric plant uses falling water to turn the turbine. The results are the same. The theory is to build a dam on a large river that has a large drop in elevation (there are not many hydroelectric plants in Kansas or Florida). The dam stores lots of water behind it in the reservoir. Near the bottom of the dam wall, there is the water intake. Gravity causes it to fall through the penstock inside the dam. At the end of the penstock, there is a turbine propeller, which is turned by the moving water. 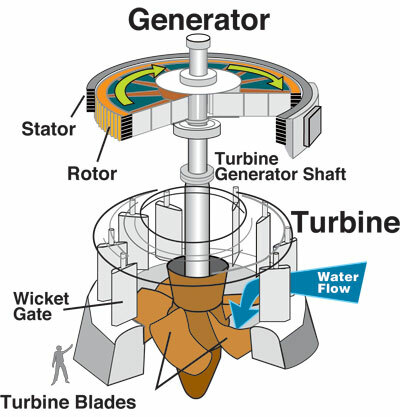 The shaft from the turbine goes up into the generator, which produces the power. Power lines are connected to the generator that carries electricity to your home and mine. The water continues past the propeller through the tailrace into the river past the dam. By the way, it is not a good idea to be playing in the water right below a dam when water is released! This diagram of a hydroelectric generator is courtesy of U.S. Army Corps of Engineers. Demand for electricity is not “flat” and constant. Demand goes up and down during the day, and overnight there is less need for electricity in homes, businesses, and other facilities. For example, here in Atlanta, Georgia at 5:00 PM on a hot August weekend day, you can bet there is a huge demand for electricity to run millions of air conditioners! But, 12 hours later at 5:00 AM …. not so much. Hydroelectric plants are more efficient at providing for peak power demands during short periods than are fossil-fuel and nuclear power plants, and one way of doing that is by using “pumped storage”, which reuses the same water more than once. Pumped storage is a method of keeping water in reserve for peak period power demands by pumping water that has already flowed through the turbines back up a storage pool above the powerplant at a time when customer demand for energy is low, such as during the middle of the night. The water is then allowed to flow back through the turbine-generators at times when demand is high and a heavy load is placed on the system. The reservoir acts much like a battery, storing power in the form of water when demands are low and producing maximum power during daily and seasonal peak periods. An advantage of pumped storage is that hydroelectric generating units are able to start up quickly and make rapid adjustments in output. They operate efficiently when used for one hour or several hours. Because pumped storage reservoirs are relatively small, construction costs are generally low compared with conventional hydropower facilities.